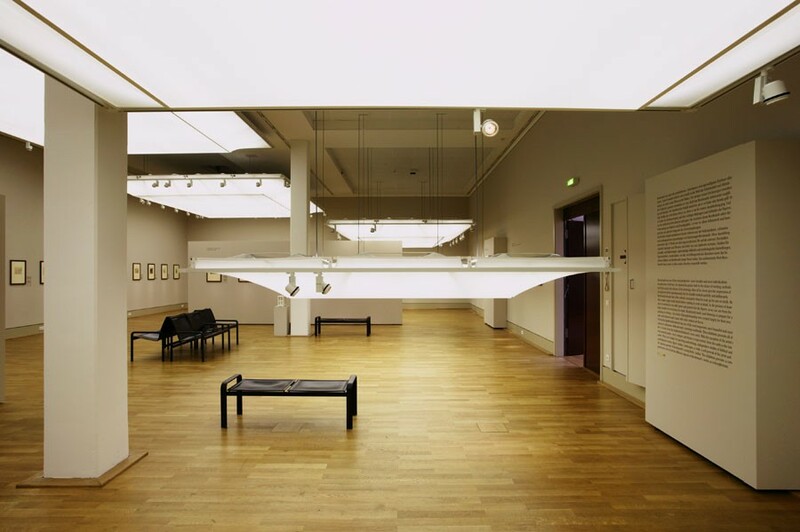 Following the large sculptures for the Berlinische Galerie, Fritz Balthaus’s next work approached the concept of “marked space” from a new angle. In it, institutional delineations of the exhibition space are brought into close view. Two like exhibition scenarios were created: one in the hallways of the Kupferstichkabinett Berlin (prints and drawings collection of Berlin’s renowned National Museums), and the other in the gallery of the art auctioneers “Villa Grisebach”. 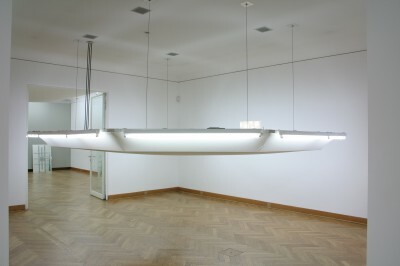 In both spaces the existing overhead lighting units (suspended fixture frames covered with stretched canvas) were lowered to differing heights where they hovered as contextually derived sculptures. Thus the same exceptional circumstances bonded two institutions of art in disparate urban locations: the museum and the auction house.